Peter Martin: Could our mining executives have been having a lend of us? Could our mining executives have been having a lend of us? And Abbott, who said the tax would kill the industry "stone dead"? Australian mining executives appear to have been saying one thing and doing another as they negotiated with the government over the resource super profits tax during May and June. Investment and investment intention figures released yesterday show that while talking of putting projects on hold and moving offshore they were both boosting spending and dramatically lifting planned spending. The Bureau of Statistics survey was conducted at the end of June and covers 8000 businesses including all those with big capital expenditure. The super profits tax was announced on May 2. 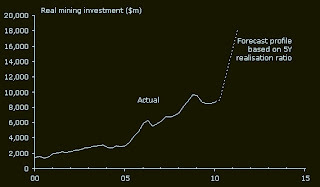 The Bureau finds that between the end of March and the end of June investment in the mining sector climbed 2.6 per cent. The figures provided to the Bureau usually come from accounting departments and so detail changes in what is actually budgeted for rather than the public position of chief executives engaged in negotiations. Investment actually undertaken almost always exceeds budgets. The economics team at TD Securities says taking into account those so-called historical realisation ratios the mining sector is on track to invest 74 per cent more in 2010-11 than it did in 2009-10. "These are aggressive expansion plans," said TD strategist Roland Randall. "Mining should invest around 5 per cent of nominal GDP." "It would be wrong to see this as acceptance of the mining tax compromise," he said. "During the time the survey was taken the mining tax was very much up in the air." The compromise brokered by Prime Minister Gillard was reached on July 2, days before the ABS deadline for returning the survey forms. "The more likely reason for boosting investment plans is faith in the strong economic ties between Australia’s vast resources and China’s vast demand for energy and raw materials," said Mr Randall. In April the benchmark price for coking coal climbed 55 per cent and the benchmark price for iron ore 90 per cent. "There surprisingly little sign of the political uncertainty and concerns over the mining tax in these figures," said RBC Capital Markets analyst Michael Turner. "Planned mining investment climbed $6 billion, planned manufacturing investment $1.5 billion." Ahead of the mining tax compromise mining was expected to dominate investment during the financial year, accounting or 45 per cent of all investment dollars spent. "Over the coming year it is clear Australia will be riding on the back of the mining sector," said Commonwealth Securities economist Savanth Sebastian. "Of the $123 billion in expected investment, just under half will be spent by miners while only 11 per cent will be spent by manufacturers". Underscoring the apparent two-speed nature of the investment surge, the figures showed total investment down 4 per cent in June quarter despite higher mining and manufacturing investment. Investment by the service sector slumped 14 per cent and investment by the rental and hiring sector 19 per cent. Both sectors plan to expand in the year ahead. Acting Prime Minister Wayne Swan declared the figures a "strong vote of confidence in Australia's economic prospects, despite continued global uncertainty".